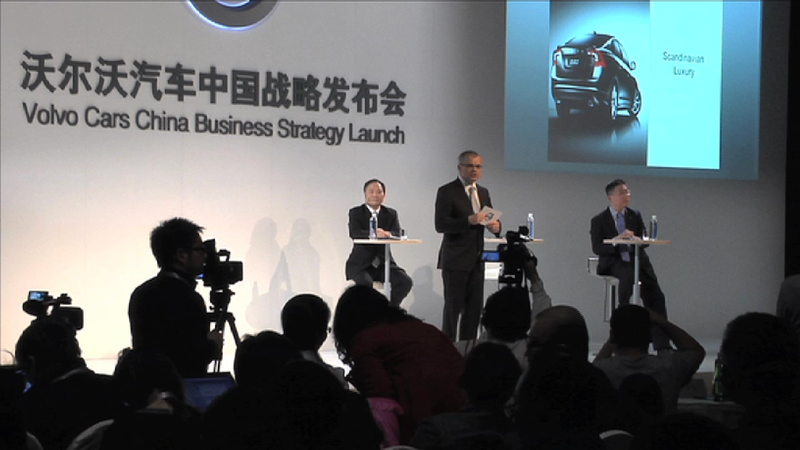 At a press conference held today, February 25 in Beijing, Volvo Car Corporation announced its strategy for growth in China. The Board of Directors at Volvo Car Corporation has decided, pending approval of Chinese authorities, to invest in a new plant in the city of Chengdu and continue investigations for a plant also in Daqing. "We regard the Chinese market as the second home market for Volvo Car Corporation and a very important part of the plan to build a successful future for the company," says Stefan Jacoby, President and CEO of Volvo Car Corporation. Li Shufu, Chairman of the Board, continues: "Together with my colleagues on the Board of Volvo Car Corporation, I am very happy with the achievements made by Stefan Jacoby and his leadership team over the past few months. We have developed a solid plan for future growth in the strategically important Chinese market. I am also happy to see that Volvo sales show a strong start in 2011 both in Europe and on the US market"
A new Board of Directors with a high degree of international business experience was appointed on August 2, 2010. Stefan Jacoby was appointed President and CEO on August 16, 2010. The all-new S60 sports sedan and the V60 sports wagon were successfully launched. Global retail sales during 2010 reached 373,525, an increase of 11.2 per cent compared to 2009. Every quarter of 2010 showed a positive financial result, which gave a full-year result that was better than expected. The company's leadership under Stefan Jacoby worked intensively during autumn 2010 and early 2011 on a revised product plan for the next 10 years in order to deliver on the brand objectives, which in turn also have been undergoing major analysis and development. As a result of the new strategic direction of Volvo Car Corporation, several organizational changes at Headquarters in Gothenburg, Sweden, have also been implemented. An entirely new Volvo organization led by Freeman Shen, Senior Vice President and Chairman of Volvo Cars China Operations has been created in China. A new Volvo Car China headquarters has been established in Shanghai, including a Technology Centre and all functions for purchasing, design, sales and marketing, manufacturing, finance, etc. "We are increasing our business presence in China from a national sales company to an organisation with all functions necessary to manage our operation in China," said Stefan Jacoby. "Our aim is to reach a sales volume of about 200,000 cars in the Chinese market by 2015." Volvo Car Corporation will, pending the approval of the Chinese authorities, build a manufacturing plant in Chengdu, 1,600 km west of Shanghai. The plant will produce only Volvo cars. The plant is based upon a business case of approximately 100,000 produced cars annually and production is estimated to start during 2013. The expansion in China will not affect operations and employment in Europe. The board also approved a decision to continue investigating the opportunities for establishing a plant in Daqing in north-eastern China. Shanghai will serve as Volvo Car China headquarters and centre for product development, design and sourcing. Among other priorities, Volvo Car China will also support Volvo Corporation R&D in Sweden regarding the development of electric vehicles and hybrids. Volvo Car Corporation puts full focus on increasing sales in China and strengthens sales and marketing activities, including expanding dealer shops from 106 to 220 by 2015, train sales consultants and improve customer experience and satisfaction. Volvo Car Corporation will optimize its sourcing network in China for the global market. Volvo Car China will start to employ new staff to work with product development for the Chinese market and support local production and purchasing. "We will build an entirely new plant in Chengdu and further investigate the opportunities for establishing an additional factory in Daqing. Our production in China will, however, not have any impact on decisions affecting capacity utilization of our plants in Sweden and Belgium" says Stefan Jacoby. Lars Danielson, previously General Manager of the Volvo Torslanda Plant, has been appointed Vice President of Industrial Systems including manufacturing and quality. Lars Danielson is based in Chengdu and is currently planning the complex work involved in constructing a new Volvo plant in the region. Volvo Car Corporation SVP & China Operations Chairman Freeman Shen says: "At our plants in China we will ensure that Volvo's global manufacturing and quality system can be thoroughly implemented." "The Volvo Car China Technology Centre in Shanghai will develop into a complete product development organization on an international level. It will have the competence and capacity to work together with the HQ in Sweden, participating in Volvo Car Corporation's work process for developing entirely new models," says Freeman Shen. Stefan Jacoby emphasises that Volvo will continue to be a contemporary luxury brand, with products built around people. The key strategy for Volvo Car Corporation is to continue to strengthen its business presence in mature markets like Europe and America while proactively exploring new emerging markets." Li Shufu says: "We continue to uphold our principle that Geely is Geely and Volvo is Volvo. A more globalised, more focused luxury brand will turn our vision of a growing and profitable Volvo Car Corporation into reality. The company will continue to contribute to the development of the global automotive industry by introducing world-first innovations that make an outstanding brand win in the marketplace."